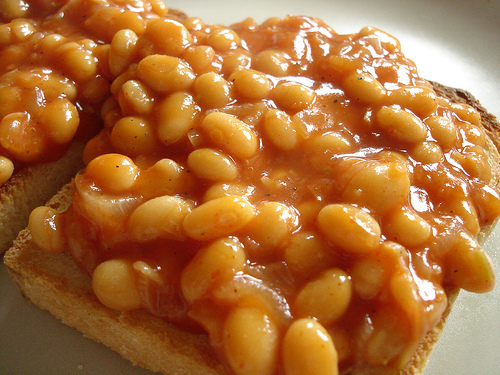 I don’t know if it’s a tragedy, disappointment or just down right luck that I spent a year in England without trying the very English dish of Beans on Toast. My American roommates arrived in the country two weeks before I did and, of course, already had adventures to tell of. One was of eating an English breakfast. Breakfast is my favorite meal. I love all breakfast food: eggs, cereal, pancakes, french toast, waffles, I would eat breakfast all day long, and sometimes do. So when Lindsay and Johnna began describing a horrifying pile of beans, toast, mushrooms, tomatoes and strange-tasting sausage they had been served at their B&B, I decided my American tastebuds were not going to like this place very much. Marmite and chip sandwich–this was actually provided by a New Zealand friend and was surprisingly good. Custard–I thought I would like it because it looks like vanilla pudding, but it’s not. Overall, Oxford and other places I travelled in England have grasped foods of various cultures and made them everyday fare. Indian, Italian, Greek and Lebanese are readily available and affordable, not to mention yummy (now I’m really sounding like a foodie). Probably like the States, it has found other cultures’ food a little more interesting to work with, but what I wouldn’t give to be sitting at an oversized creaky wooden table at the Eagle and Child, slicing into a thick piece of roast… That drips English cuisine to me. Hi Andrea!! Mike LOVES beans on toast. I think he has it twice a week, at least. Not my cup of tea, so to speak. let’s not even talk about the black pudding and haggis i ate…..
i’m so glad you did a post in which you mention at least one of the various eating establishments that swayed your decision to attend oxford brooks over stinky st. andrews.